By Andreas Engelhardt and John Broadbent, Thermacore Europe Ltd, Ashington, U.K. Liquid cold plates can look deceptively simple, but what are the benefits of one technology over another, and what are the respective manufacturing processes? How would one select a manufacturing partner for these products? One way would be to select a vacuum brazing provider, offering thermal products (cold plates) as a limited part of their brazed product range, based on their extensive metal-joining portfolio. Alternatively, why not talk to Thermacore, a thermal solutions provider with over 40 years of experience in the design and manufacture of thermal management solutions and a company that has invested in vacuum brazing furnaces and associated processes in two locations, Northumberland, U.K., and Pennsylvania, as part of the processes required to provide state-of-the-art thermal management solutions? High temperature resistance of joints. 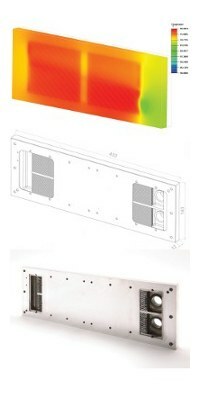 In order to produce high-performance thermal solutions, Thermacore design engineers begin with the use of industry-standard CFD (computational fluid dynamics) software, as well as proprietary spread sheets, developed over the last 40 years to determine thermal requirements, such as component temperatures, coolant temperature rise, pressure drops, and flow-rate optimizations. 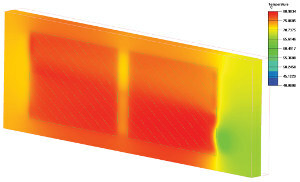 Figure 1: Temperature distribution across liquid cold plate surface. But, as these results alone do not lead toward manufacturable products, engineers apply mechanical design rules, which have been developed through thousands of hours of design and manufacturing experience, to each individual product design. The application of this know-how allows Thermacore to convert high-performance thermal designs into cost-effective solutions that meet or exceed the expectations of the customer. This vast reservoir of experience-gained knowledge is equally applied to new design solutions, as well as on a consultancy service basis to "build to print" scenarios, where potential design flaws are highlighted and possible improvements are suggested. 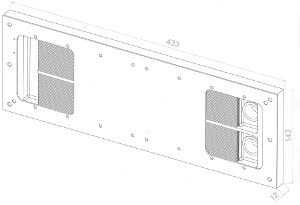 Figure 2: CAD design of cold plate completed. Once the design is completed, the component can follow the vertically integrated manufacturing route, with machining, vacuum brazing, heat treatment, test, and stringent quality control, all under one roof. Vacuum brazing is one of the key manufacturing processes, and part of the brazing process family, where a filler material is taken above its melting temperature, which exceeds 450 degrees C. This filler material is then fed between close-fitting components and distributed by capillary action, or in the case of vacuum brazing is already in place before the heating process begins. Once all the filler material is molten, the part is cooled down, and the filler material forms a joint through atomic attraction and diffusion. During vacuum brazing, the parts are placed in a vacuum furnace, which provides the required heat and at the same time removes the need for flux and the risk of oxidization during the process. The components will be clean and bright after brazing. Figure 3: Vacuum brazing furnace. Depending on the requirements of the part and its complexity, a helium leak check can be part of the standard procedure at this stage. Once leak tightness has been ensured (and when required), the parts will undergo heat treatment to either a T4 or T6 hardness stage. This will allow machining at similar feeds and speeds as those for untreated aluminum. Depending on individual part geometries, additional processes such as straightening may allow more effective ways of machining the finished components when required. Products that are typically vacuum brazed are liquid cold plates, flat-tube heat exchangers, and plate fin heat exchangers, but certainly not limited to these components. Generally, vacuum brazing is employed as a process, where lightweight, high-performance assemblies with increased internal surface areas are required. Additionally, vacuum brazing can be used to produce larger assemblies with complex geometries, benefiting from the low distortion introduced by the process itself. These structures can range from plank-type assemblies with internal channels to electronic enclosures, with and without internal features such as cold walls. 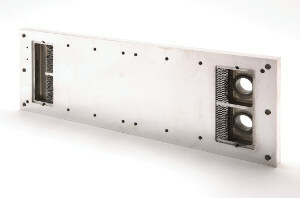 Figure 4: Cold plate modified for demonstration purposes. All of the aforementioned products benefit from the high internal cleanliness due to the fluxless process, and the lack of other substances involved in the process. Wave guides are amongst the non-thermal products that are also regularly produced by vacuum brazing. With any of the products mentioned above, early involvement of Thermacore engineers not only reduces the time to market, it may also significantly reduce the number of design iterations required to achieve the desired product quality. 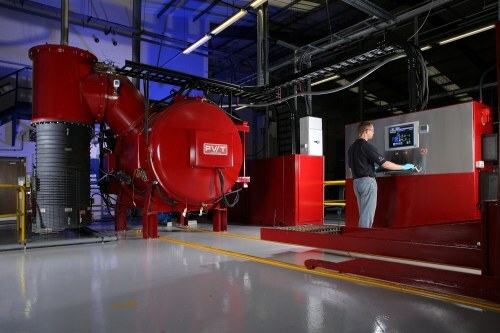 Thermacore carefully controls all its manufacturing processes in order to achieve and maintain a 98 percent-plus yield on proven-out designs and products. The application of proven design rules leads toward an improved product from the onset of a project, a service that is rarely found with normal contract brazing houses. The market segments that vacuum brazed assemblies can be found in are quite diverse. They can range from automotive products, such as oil cooler-type assemblies, at the lower cost end of the market, toward highly complex assemblies, with reduced weights, for the aerospace or defense industries. Recently, the power market and renewable energy technologies, as well as the emerging market of electrical and hybrid electric vehicles, have shown a significant interest in vacuum brazed assemblies to cool their components. These include components such as batteries and DC-DC converters, but are not limited to these. Generally, vacuum brazed assemblies can be found in markets where good-quality joints, lightweight assemblies, and high thermal and mechanical performances are required. Vacuum brazing is an attractive manufacturing method to produce lightweight and reliable assemblies and thermal products, such as heat exchangers and liquid cold plates. Vacuum brazed products are of a superior quality in comparison to other joining technologies such as conventional salt dip brazing and TIG welding. Additionally, there are no further requirements for internal cleaning of the assemblies, and contamination risk of the system due to salts and other factors is non-existent. There is less distortion and a cleaner exterior due to the fluxless process. Superior thermal performance can be achieved through the ability of producing complex internal geometries and significantly increased heat transfer surfaces. Thermacore can be considered to be a one-stop provider for numerous vacuum brazed products, such as liquid cold plates, chassis and cold wall assemblies, and heat exchangers, but also other products produced through vacuum brazing. Additional services range from the design of the entire thermal solution to consultancy for existing designs. Pre- and post-braze machining of components and assemblies enables the delivery of complete components and thermal solutions. If you require any further information regarding vacuum brazed products and services, please do not hesitate to contact your Thermacore representative.